Hot peppers may not provide the foundation for many seasonal meals, but they can help transform some basics into something far from ordinary. Instead of another batch of coleslaw, try mixing up this local twist on Thailand’s som tam using green cabbage instead of the more typical green papaya. 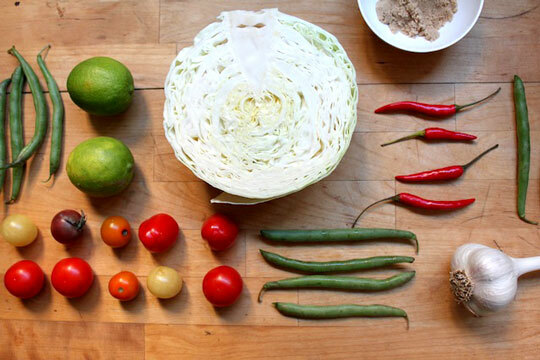 This CSA-friendly meal requires no cooking and little more than a splash of fish sauce and a chop of chili to transform a simple cabbage slaw into something nutty, sweet, hot, sour, funky and wonderful. Once you’ve chopped your cabbage, it’s a dish that comes together quickly and requires little more than some rice and grilled chicken to make a meal. I learned to make som tam from a roommate who employed the typical method of pounding the ingredients together in an enormous, cone-shaped mortar and pestle. The friction bashes the juice from the limes and tomatoes, softening the green beans and transforming the cabbage from dry shreds to something saucy. In the absence of such a mortar and pestle, I make som tam by layering the ingredients in a quart sized wide-mouth canning jar and crushing them with a wooden muddler, but a rolling pin or a wide wooden spoon handle would also do fine. In a large, sturdy, narrow vessel (like a quart-sized wide mouth canning jar) layer all ingredients. Beginning with a small handful of cabbage, followed by a lime segment, a few tomato halves, and a few slices of garlic. Add more cabbage and add a few green bean segments, and a chili. 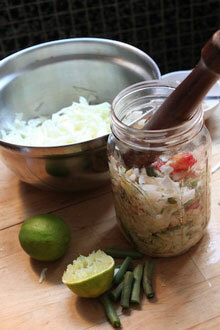 Repeat, alternating cabbage with other ingredients until the jar is ¾ full. Add sugar and fish sauce. Using a muddler, or another sturdy wooden kitchen implement, pound all the ingredients together until the tomatoes and chili begin to break apart and the cabbage and green beans start to appear juicy instead of dry and things wilt down a bit. About 30 seconds. Continue building layers on top — at this point you should have used up most everything except for the shredded cabbage — and resume pounding. Once everything in the jar looks uniformly saucy, empty the contents of the jar into a bowl with any remaining cabbage and the roasted peanuts. Mix thoroughly and taste. Add more sugar, lime juice, or fish sauce to taste. Allow to marinate at room temperature until you’re ready to serve.